First things first, I’m now a consultant for The Body Shop At Home*** and earn commission on sales made directly through me. That said, it was the 2016 launches & relaunches the Drops of Light and Drops of Youth ranges that reaffirmed my faith in the Body Shop as purveyors of skincare gems. I’ve tried items from most ranges at The Body Shop over the years; I’ve loved some, liked others, and found others middling or average at best. I only recommend products that I love and am honest about the average stuff. The Drops of Youth Night Mask is by no means average. Ingredients: Aqua/Water/Eau, Propanediol, Glycerin, Dimethicone, Helianthus Annuus Hybrid Oil, Polysorbate 20, Diheptyl Succinate, Acrylates/Beheneth-25 Methacrylate Copolymer, Phenoxyethanol, Tocopheryl Acetate, Orbignya Oleifera Seed Oil, Benzyl Alcohol, Caprylhydroxamic Acid, Sodium Hyaluronate, Sodium Hydroxide, Parfum/Fragrance, Disodium EDTA, Adenosine, Caffeine, Capryloyl Glycerin/Sebacic Acid Copolymer, Linalool, Citronellol, Leontopodium Alpinum Meristem Cell Culture, Limonene, Citric Acid, Xanthan Gum. The Drops of Youth Night Mask is an intense hydrating overnight treatment that helps skin retain moisture. With regular use you see the skin retains its elasticity and natural firmness. The active ingredients are Helianthus Annuus/ Sunflower Oil (retains moisture), Orbignya Oleifera Seed Oil (nourishing properties similar to coconut oil), sodium hyaluronate (a water soluble hyaluronic acid, which acts as a cushion to promote collagen and elastic), caffeine (which has antioxidant properties, especially when exposed to UV light), Edelweiss/ Leontopodium alpinum (has anti-inflammatory and cytoprotective properties). Anyone in their early twenties up to forties with dry, normal or combination skin. If you have oily skin, then I would recommend a lighter night time moisturiser rather than this mask. The sooner you start using high quality hydrating skincare, the better your skin will be when you hit your golden years, as you will be preventing loss of firmness from an earlier starting point. In my opinion, it is not effective on mature skin. All of the low-starred reviews on the Body Shop website come from those who have been mis-sold the product as suitable for mature skin or as an instant fix. Addressing those issues in turn, firstly mature skin often will already have lost a lot of its natural elasticity and firmness. The Drops of Youth Night Mask can’t regenerate the skins barrier but it does help maintain that barrier, and thereby slows down the effects of ageing on the skin. Secondly, it is not a miracle worker though, no no no. Any anti-ageing skincare that promises immediate results is probably short-cutting somewhere and giving you ingredients that give the appearance of better skin. To actually improve your skin from within, you need to use a skincare product for a few weeks to see the first signs of improvement and you’ll start seeing significant improvement over a longer period of a few months. Apply a thin layer over face after cleansing. Leave on for 10 minutes then rinse off with warm water. Use once or twice a week. I don’t do that. A little naughty, I know. I apply a thin layer (a really small amount, not even a full scoop and it’ll be enough for face and neck) over my face at night after cleansing, and then I leave it on overnight, and rinse off in the morning. Not that different but it just allows a bit more time for the ingredients to really penetrate the skin. As it is not a cleanser, there are no adverse effects of leaving it on overnight, no dryness or sensitivity. All I get in the morning is really smooth, naturally hydrated skin with a little bounce to it. I actually compared my skin with my kids and it was as smooth as my seven year old, but not as smooth as my five year old. Over the past 4 months that I’ve used it, I have seen an improvement in the overall firmness and elasticity of my skin, and have even been using a little on top of my usual moisturiser in the daytime. Although I m using it daily, I haven’t even used half of the pot yet. If you use more than about three-quarters of a scoop on your face, then it’s probably a bit too much. Remember a little goes a long way. *** I am a Body Shop At Home consultant and do earn commission on any personal sales I make. All my reviews are 100% honest, and you will see a mixture of positive and less than favourable reviews of Body Shop products. 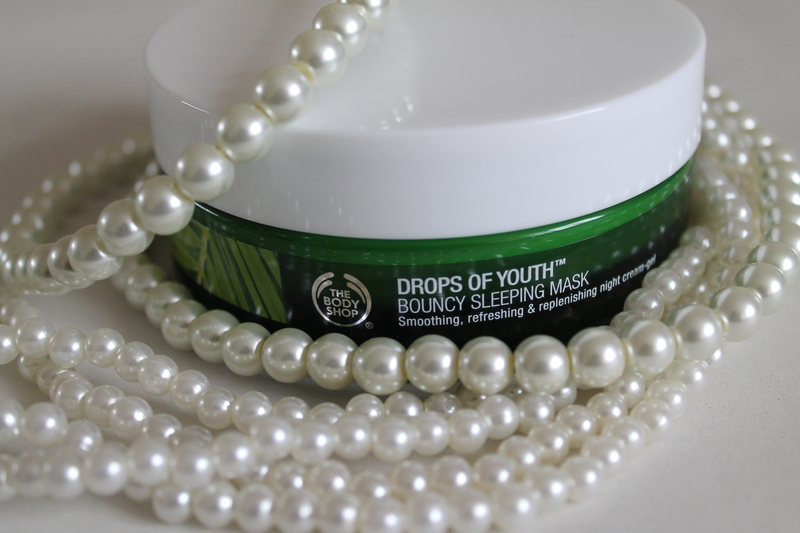 Leave a reply on "Skin deep: Body Shop Drops of Youth Night Mask review"